Unfortunately a bicycle is a desired item for ‘spur of the moment’ thieves or the professional. It is almost impossible to stop the latter but good locks can deter the former. When leaving a bicycle unattended it is always advsed to lock it to a permanent structure or cycle stand in a well-used and properly lit area where it is visible to passing pedestrians. There are more than 500 cycle stand spaces in Bedford town centre, 612 at the railway station and more than 3,000 at other public/private locations on which to secure a bicycle. Use a good quality lock that matches the value of your bicycle. If necessary use two different types - a D-lock as well as a flexible one. Thread it through the frame and at least one wheel if using one lock and secure it to the cycle stand, railing or other immovable object. Remove and take with you quick release valuables such as lights, pumps and panniers. Ensure your cycle is easily identifiable. Make a note of model, frame number, colour and any accessories. Also photograph it and have the underside of the frame marked with a post code. Insure your cycle and if it is stolen report it immediately to the Police. There are a number of schemes where you can register your bicycle on a website but one recommended is Immobilise. Bedfordshire Police regularly organise events where you can get your cycle marked and receive crime reduction advice. A leaflet can be downloaded on how to keep your bike safe. London Cycling Campaign have a video showing you how to lock your bicycle which can be viewed here. Please note that the most common bike stand used is the 'Sheffield' type as shown in the illustration at the top of the page. There are other types, many are 'not fit for purpose' types in which only the front wheel can be secured allowing the rest of the bicycle to be easily removed and if knocked has the potential to buckle the wheel. 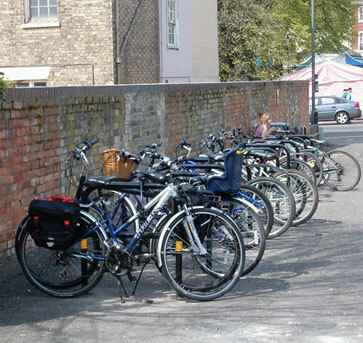 The Bedford Borough Council's cycle parking guidance document can be seen here. From a high of 72 bike thefts during 2014 to a low of 17/21 at the beginning of 2015 the number has been slowly increasing again and has now reached a similar level (see figure below). Over the last 12 months 563 bikes have been stolen in the Borough. The top five hot spots were the Town Centre and Cauldwell, Harpur, De Parys and Newnham Wards. In England and Wales there were 97,011 bike thefts for the year ending June 2018 representing 2 thefts per 1,000 population, down -4% from the previous year. Full crime data is available from the Office of National Statistics (ONS) website under Table 3 here.